Nobody can stop Roger Federer on grass. No. 1 got even against No. 2 as Federer ended a five-match losing streak to Rafael Nadal on Sunday, winning 6-0, 7-6 (5), 6-7 (2), 6-3 to earn his fourth straight Wimbledon title and eighth Grand Slam championship. Nadal had beaten Federer in four finals this year, including at the French Open last month, but couldn't match him on the Swiss star's favorite surface. Not here, not in my house, not on Centre Court, not on the biggest stage in tennis. That was Federer's response to the 20-year-old Spaniard's challenge. The milestones keep piling up for the 24-year-old Federer, who strengthens the case for consideration as being among the greatest players of all-time. In winning his 48th consecutive match on grass, he became the third player in the Open era to capture four successive Wimbledon championships, joining Bjorn Borg (five straight from 1976-80 and Pete Sampras 1997-00). "They're heroes of the game," Federer said. "This is the most important tournament, and to win four is out of this world. I'll come back and try for a fifth." When Nadal sliced a backhand wide on match point, Federer raised his arms in the air, threw back his head and closed his eyes. After the two players embraced at the net, Federer slipped into his customized cream-colored blazer to receive the winner's trophy from the Duke of Kent. Asked about his rivalry with Nadal, he said, "Now I like it again." Federer is the eighth man in history win to four or more Wimbledon titles. William Renshaw and Sampras lead the list with seven championships, but Federer is clearly on course to break the mark. "It's fantastic," he said. "I never thought it possible, but I made it. It's really an incredible feeling. I was doubting myself early on in the tournament with the draw and the expectations. So to be through all over again and to play against Rafael in the finals is obviously fantastic." Nadal came into Sunday's match with a 6-1 record against Federer. Federer's only losses this year have been to Nadal  he was 55-0 against everyone else. 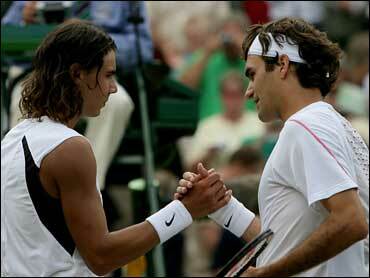 But anyone who thought Nadal had gotten into Federer's mind was wrong on this day. Federer proved that he's on another level on grass with his big serves, smooth strokes and quick hands. While Nadal, winner of a record 60 straight clay-court matches, surprised everybody by getting this far, his brutal, relentless game wasn't enough to take Federer out of his comfort zone. "This is a difficult surface," Nadal said. "But this year I played my best tournament here. It's unbelievable. I hope next year I don't play against one guy who plays like Roger. He played unbelievable on this surface."